Discovery plugins have only one responsibility, finding new URLs, forms, and other “injection points”. A classic example of a discovery plugin is a web spider. This plugin takes a URL as input and returns one or more injection points. When a user enables more than one plugin of this type, they work recursively: If plugin A finds a new URL in the first run, the w3af core will send that URL to plugin B. If plugin B then finds a new URL, it will be sent to plugin A. This will go on until all plugins are run and no more knowledge about the application can be found using the enabled discovery plugins. Audit plugins take the injection points found by discovery plugins and send specially crafted data to all of them in order to find vulnerabilities. A classic example of an audit plugin is one that searches for SQL injection. 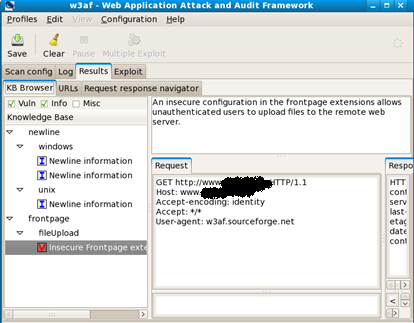 Attack plugins objective is to exploit vulnerabilities found by audit plugins. They usually return a shell on the remote server, or a dump of remote databases in case of SQL injections. -s <file> Execute a script file. -g Run GTK user interface. -i <dir> Directory where MSF is installed (only used to install the virtual daemon). right click empty profile and select and appropriate name for the new profile. Insert the url of the target. This is a really nice tool and getting better with every release, one to have!